Our dog daycare offers up to 12-hours a day of supervised dog-dog-group play Monday through Saturday and we offer limited daycare availability on Sunday! If you have a high energy dog and would like them to be tired out when you get home from work, then doggy daycare will be a helpful solution for you. Or maybe your dog enjoys other dog companionship every now and again. At Happy Pets, our indoor/outdoor dog boarding and dog daycare facility provides your dog with hours of human interaction with our trained and loving staff and playtime with other dogs that closely match their size or play temperaments. Pre-screening evaluations are required for all dogs coming for dog daycare. We make sure all dogs are non-aggressive and suitable for dog-dog group play. Our pre-screening evaluations are done on your first day of daycare and usually take 3-4 hours. Normal daycare rates apply. All dogs must be current on rabies and distemper and these vaccinations must be administered and documented by a licensed veterinarian. Dogs of appropriate age must be neutered/spayed. Males must be neutered by 7-8 months and females spayed by 10-12 months. All dogs must also be free of flea, tick and other parasites such as ear mites. Dog playground equipment both inside and outside. Dog agility equipment of different styles and sizes from Playtopia. Above-ground Swimming Pools for dogs who want to Splash It UP! Story Hour for a soothing human voice and snuggle up time with our pet care specialists. Chasing Bubbles in the air when we blow bubbles through bubble wands! Dogs are intrigued and fascinated with the bubbles! It is so cute to watch them! And YOU can watch the dogs interacting too using our live-stream webcams! We have four separate dog playgroups to ensure an appropriate fit for your dog’s energy and comfort. If you have an extra small dog, our teacup dogs (up to 10-lbs) have an indoor playground to play with other teacup and toy size doggies. Our other 3 indoor/outdoor playgrounds are for dogs over 10 lbs. Our inside facility cover 5,000 sq. ft. of temperature controlled environment with ceiling fans for air movement and soothing music for enjoyment. Our outside playgrounds are 2500-sq ft using artificial turf and small crushed granite where the dogs usually potty. Our facility is cleaned using a centrally plumbed Aqua Air wet/dry vac system that works like a central vac for your home and the cleaning solutions have enzymes that are pet-friendly and environmentally friendly. Those enzymes break down bacteria and keep our facility, the turf, and all the doggy playground equipment clean, sanitized, and smelling fresh. Bring your Dogs to Socialize, Play and Make New Friends! We are similar to a convenient drop-off supervised dog park but in a temperature controlled environment. 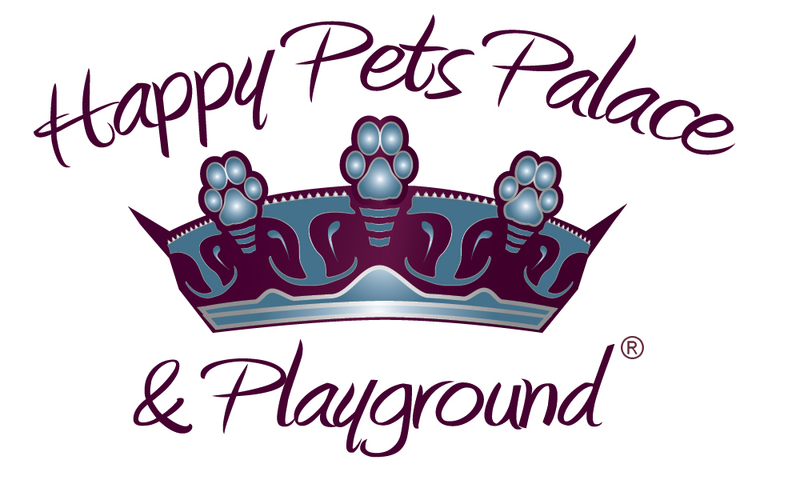 And with the added assurance of live webcams to check in and see what your dogs are doing you can rest easy knowing they are well cared for and enjoying their time at Happy Pets Palace. Call us today at 480-207-1852 if you have additional questions or to schedule your dog’s meet and greet pre-screening evaluation. Evaluations are done on your dog’s first day of daycare. Packages good for 365 days. There are no refunds available on daycare packages or boarding services. 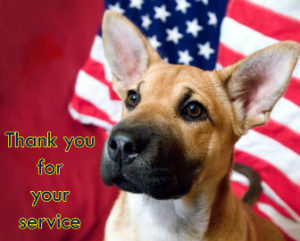 All active duty military and veterans receive a 10% discount on daycare and boarding. Puppies socializing is perfect for puppies from 4-months old up to one year old. Puppies can play for a full day of doggy daycare on Puppy Wednesdays at $20, the half-day rate. If your puppy eats lunch, be sure to pack their lunch for them to enjoy at lunchtime. It is a very popular time for new puppies to learn socializing and play skills from other dogs and lots of puppies. It’s a pretty fun and active day! Puppies must have their 3rd distemper vaccination and must have their Bordetella vaccination before coming to Happy Pets Palace. This usually happens around 4 months old. Rabies vaccine is due by six-months of age unless you live in Maricopa County. Maricopa County requires all dogs have their rabies vaccine and be licensed at 3-months of age. Male dogs must be neutered by 7 or 8-months of age. Female dogs must be spayed by 10 to 12-months of age. We require all dogs be appropriate and suitable for co-ed group play and not show any signs of aggression. Female dogs cannot be in season. All puppies must pre-screen before being allowed to play on Puppy Wednesday. We need to make sure all dogs are a good fit for our group play environment. Call 480-207-1852 to schedule your dog’s meet and greet pre-screening appointment.